It seems the rumor of a high end Nikon are out and about. On the message boards at DP review there is talk of an 18.7 megapixel almost full frame sensor made by Sony believed to be at the heart of the new Nikon. This would be a radical departure for Nikon who in the past have stated they will not use a full frame sensor. Rumored to be the Nikon D3, the new Nikon is supposed to handle low light better than it’s predecessors and would be a welcome arrival for Nikon shooters hot on the heels of the release of the Canon 1D Mk 111. All Nikon’s digital SLRs so far, by comparison, use the company’s DX sensor size with a 1.5 factor. 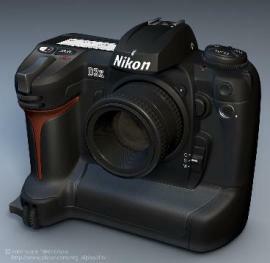 Some D3 rumors, though, say the D3 will use a 1.1 factor, meaning that the sensor is nearly full-frame. That constraint would likely mean that the newer DX-specific lenses wouldn’t work. Below a mock up of the D3. A *mockup*?? Nah, just an artist view of an imaginary camera. That is what I mean’t by mock up. An artists mock up. I don’t think it will look anything like this, very weird body. Thanks for the comment and the interest, and we appreciate your efforts in keeping us accurate. I like the name HaHa at no@nono.com. We wont bite, keep an ear on the podcast.